Photo contributed by Cheryl Siebrass, from the Carl and Christine (Andersen) Petersen collection. 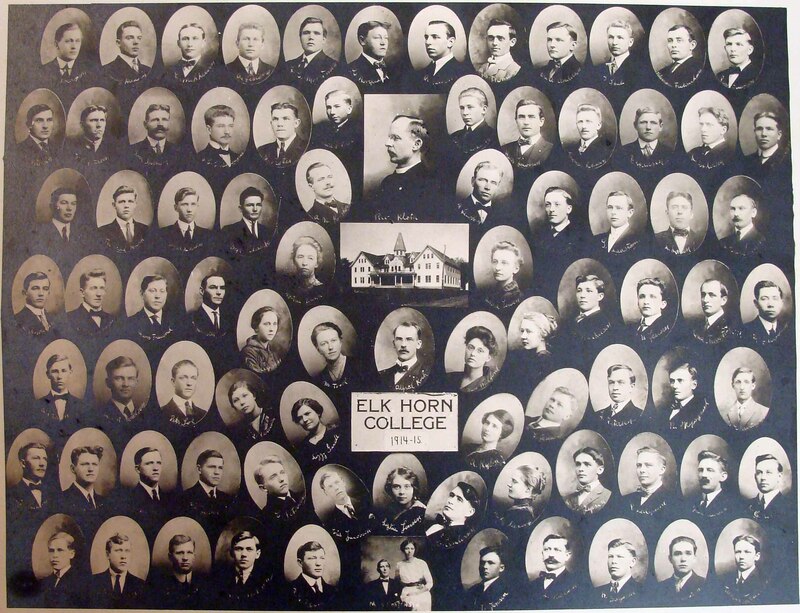 It isn't clear if those pictured were the graduating class or just those at the school during 1914-15. Each individual photo has a handwritten name in white ink near the bottom edge. Thanks to Denise Wurner for taking the time to transcribe names from this photo and also for cross referencing those names with the 1915 Census records. The following names are provided in the 1915 Iowa State Census, which indicates they were attending "Danish Lutheran College," otherwise known as Elk Horn College, at the time of the census, but cannot be identified in the photograph. Contributed by Cheryl Siebrass, May, 2010.